(NORTH BAY, ONT.) -- Chewie, a remarkable two-year old yellow lab training to be a trauma support dog for the Victim Services Nipissing District, is learning what it’s like to take flight. 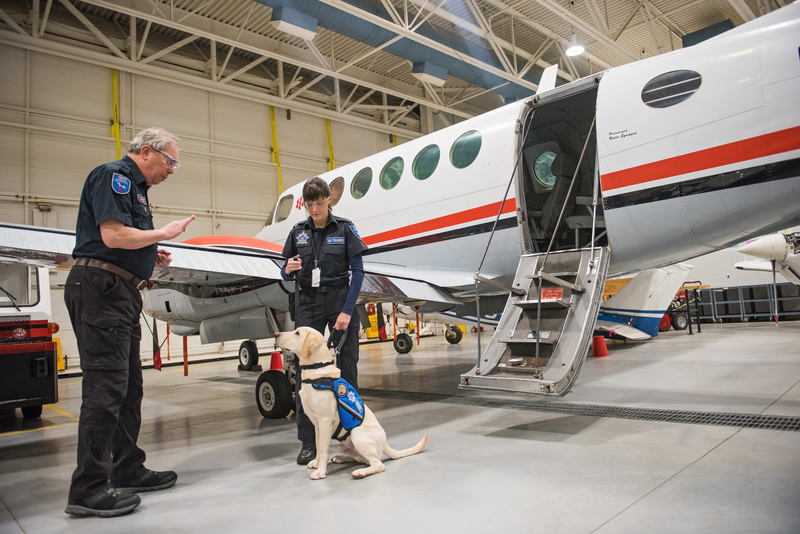 Over the last couple of months, Chewie and his handler Gillian MacIntosh have visited Canadore College’s Aviation Technology Campus to normalize air travel onboard different sized aircraft. Practicing on different-sized planes like Canadore’s Mitsubishi MU-2, Piper PA-31 Navajo, Beechcraft King Air 350i and Sikorsky S-76A helicopter have allowed MacIntosh and Chewie to master boarding, seating and deplaning from aircraft with different configurations. Chewie is undergoing specialized training as a part of the Citadel Canine Society program, delivered by Kean’s K9 Obedience, Citadel’s northern Ontario training partner of choice. The young dog has been working with Kean and MacIntosh for about eight months, after being donated by Pacific Coast K9 at one year of age. Chewie still has about six months of training to undergo before being ready to be in full service. There are currently 16 teams in training under the North Bay division of Citadel Canine Society. The program works with veterans, police officers and first responders who require the assistance of a service dog trained to support challenges associated with post-traumatic stress disorder or an occupational stress injury. 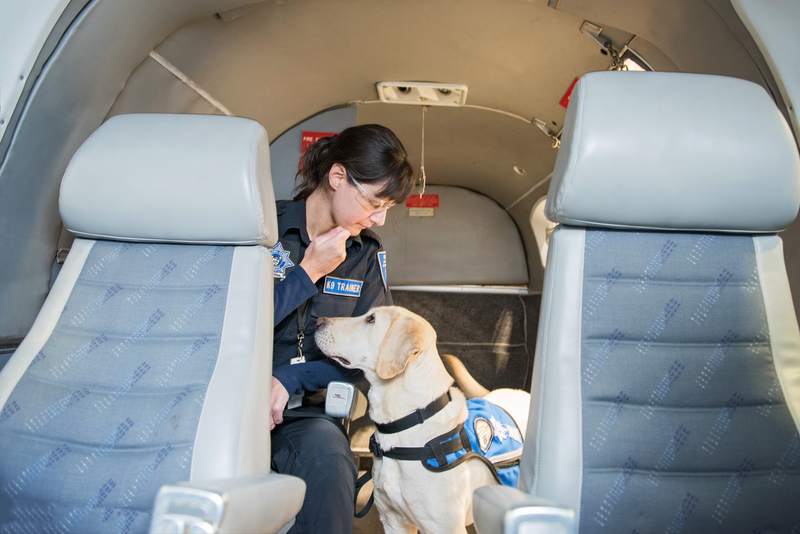 “Gillian and Chewie are responding very well to the aircraft familiarization training and the next step is to go airborne, which will allow the team to work in a remote community if requested.” said Kean. 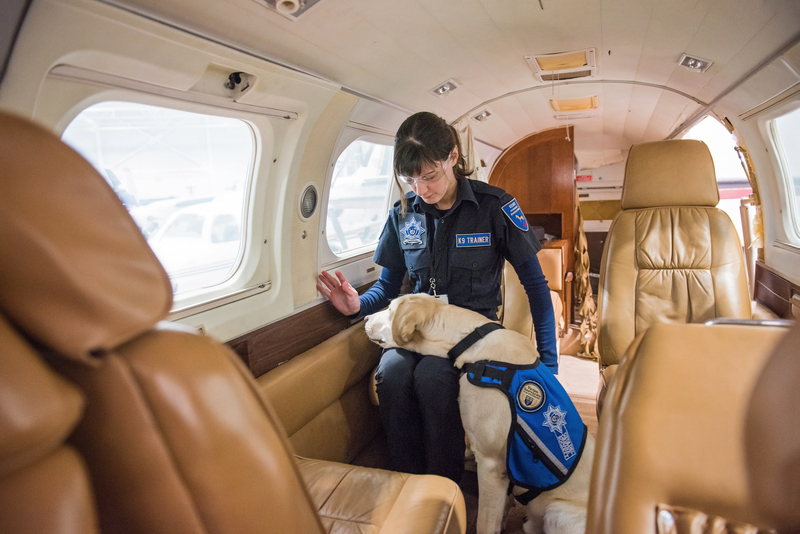 Trauma support dogs like Chewie learn how to provide pressure therapy to individuals in need, which can play a part in de-escalating high stress incidents and through their presence alone often bring comfort to victims of shock and trauma.